Yes folks, the discounts are here and that means it's a fantastic opportunity to get the best price on a range of cheap noise canceling headphone deals. Take a look below and we'll tell you a bit about what these headphones are if you're a little unsure and then show you some of favourite ones that don't cost the earth along with some extra detail on each individual model so you can make an informed decision before we show you the latest sale prices. Active Noise Cancelation / Reduction (ANC/ANR for short) analyses the sound around you and creates a sound wave to neutralise it. The result: background noise vanishes. That means better audio for you, and no need to turn the volume up to potentially damaging levels. 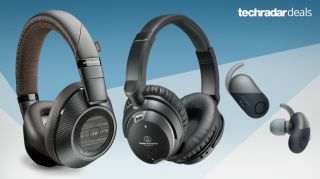 It’s possible to spend an enormous amount of money on headphones – for example at the time of writing a set of Nuraphone noise canceling headphones is $399 / £349 and Bose Quietcomfort 35 Series II are $349 / £289 – but you can get very good cheap noise canceling headphones for well under $250/£200 and we're going to point you towards the best options for the best prices. Every set of headphones we’ve picked does a great job of active noise cancelation, and some are designed for specific activities such as sports. These headphones are award-winners, with a coveted 5-star rating from the prestigious What Hi-Fi magazine. Now the price has fallen considerably they’re an even better buy. The noise cancelation is very good indeed, and like other AKG headphones there’s good, solid bass without overpowering the midrange and treble. They’re comfortable, too, which is an important consideration if you’re using them on your travels. The battery is good for 15 hours of playback over Bluetooth. If you just want noise cancellation, you’re good for a whopping 30 hours of peace and relative quiet before you need to find a charger. Note: available in wired or wireless versions. Like many headphones these Sennheisers are quite bass-heavy, which can be a bit much on boomier tracks, but they’re good on vocals and other mid-range tones if a bit lacking at the higher frequencies. As with many noise canceling headphones the sound is made to flatter recordings, and that means losing some accuracy. The Sennheisers are comfortable for most users, although for those of us with larger heads they can feel a little tight after a while wearing them: they could do with a little extra padding under the headband. Battery life is 19 hours or 25 with noise canceling turned off. The Audio-Technica ATH-ANC9s have been around for a few years now, and while more recent rivals offer slightly more effective noise canceling tech the sound here is the real selling point for buyers who prefer clarity to over-the-top bass. It’s excellent and inviting across all kinds of audio: snare drums snap, kick drums are tight and vocals and dialogue remain crystal clear and well separated from the rest of the music. The middle’s a little muddier with noise canceling switched on but it’s not a deal-breaker. The overall sound makes the ATH-ANC9s well worth considering if your key consideration is sound quality. The best noise-calling headphones for the gym goer? Most noise canceling headphones are big, for good reason: those ear cups help block out some ambient noise, reducing the amount of work the circuitry has to do. Sony’s tiny earbuds have no such assistance, and unfortunately it means the flaws in the noise canceling circuitry are apparent: their noise canceling capabilities are modest compared to their larger rivals. The main attraction here is portability, as these are headphones you can wear during a workout. Sound quality is okay rather than spectacular – the bass is a little overcooked for some listeners – but they’re sweat-resistant, look pretty funky and most importantly of all they’re comfortable to wear no matter how hard you’re hitting the gym. The second generation of Plantronics’ BackBeat PRO drops the weight (from 340g to 290g) but retains the familiar Plantronics sound: it’s not one for audiophiles as it emphasises the bass and dulls the highest treble a little too much for some tastes, but it delivers a perfectly creditable experience with pretty good noise canceling too. The big draw here isn’t the sound, though. It’s the battery life, with up to 24 hours of listening between charges and up to 180 hours on standby. That means it’s really good for frequent flyers and other seasoned travellers as it’ll last through multiple trips between charges.